A seasoning mix with tomato, cheese and spices for tuna pasta bake. 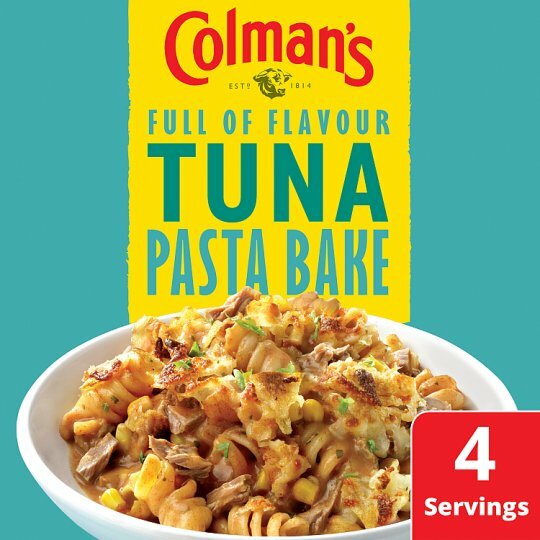 This packet of Colman's Tuna Pasta Bake seasoning mix helps you create tasty, hearty meals for the whole family to enjoy. Containing a carefully selected blend of herbs and spices, it has never been easier to serve up ‘meals that say it all'. Cook the pasta following the directions on the packet. Tip the contents of the sachet into a saucepan, add a splash of milk and mix well, then stir in remaining milk. Bring to the boil, stirring continuously. Add the tuna, sweetcorn and cooked pasta, simmer for 1 minute stirring continuously. Pour into an ovenproof dish. Top with crisps and cheese and place under a hot grill until golden. Enjoy with a mixed salad. Why not try serving your Tuna Pasta Bake with a mixed salad. Quickly and simply create a delicious tuna pasta bake to satisfy the whole family! Step 1: saucepan Cook the pasta following the directions on the packet. Step 2: saucepan Tip the contents of the sachet into a saucepan, add a splash of milk and mix well, then stir in remaining milk. Step 3: saucepan Bring to the boil, stirring continuously. Add the tuna, sweetcorn and cooked pasta, simmer for 1 minute stirring continuously. Step 4: casserole dish Pour into an ovenproof dish. Top with crisps and cheese and place under a hot grill until golden. Enjoy with a mixed salad.